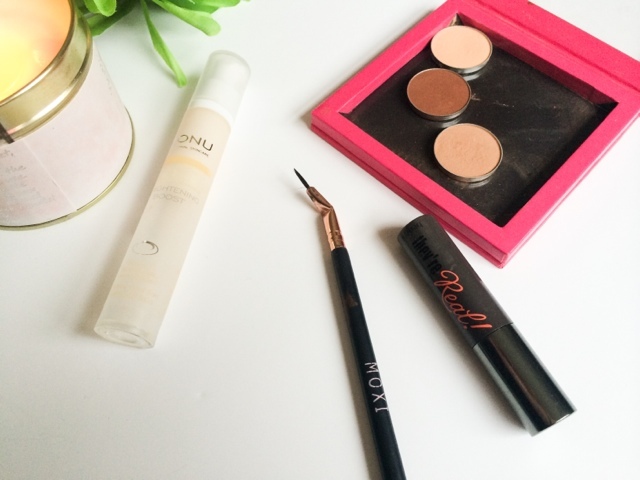 Moxi Eyeliner Brush - I won this and other brushes in a giveaway and have loved it ever since. The angle on the brush makes applying eyeliner a breeze. The slant allows you to get right to the bottom of the lash line without your own lashes getting in the way, and I feel like my hand it a lot steadier as if the weight has been evened out due to the tilted head. I don't know, all I know is its made eyeliner a hell of a lot easier and I'm forgiver grateful this is now in my life! Makeup Geek Eye Shadows have been a firm favourite of mine since I got them last month. The pigmentation and blendable shadows have seen there way in to my everyday make up routine and no eye look has been complete without at last one of these being used. Benefit They're Real Mascara* has seen its way back in to my make up staples draw. The long wearing formula has coated my bottom lashes all month, it lengthens and thickens them without flaking or smudging - I forgot just how damn good it was! Monu Brightening Boost serum* is another forgotten item. I started using this a few moths ago and initially loved the light weight formula that is meant to brighten and even out the skins texture, but like most products I found myself trailing something new and this was pushed to the back of the line. Since I've reverted back to it my skin is looking fresher and brighter and the old scars from past blemishes have started to fade and become less obvious. Gelish Nails. This month and last month have seen me wave goodbye to nail polish and have them coated with the high shine, long wearing formula that is gel nails. I love how fresh they make my nails look, everyday is a good nail day and they look just as good after 3 weeks then they did when first applied! Yankee Candle Early Sunrise* is a much loved scent I have been burning this month. I love how understated and subtle it is, but still refreshes my room. Most Yankee Candles I own are very potent, which is great at really filling the room with scent, but sometimes I like to have something burning which isn't too obvious and this has been it. Just lifting the senses with its fresh and relaxing aroma. Makeup Geek Domed shadow brush. 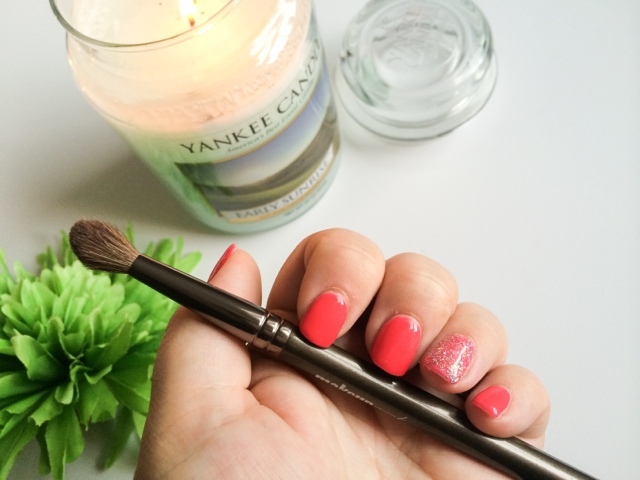 This is my first Makeup Geek brush and so far I'm really impressed! The soft bristles are dense and pack on the shadow beautifully while still blending the shadow out for a seamless transition. I'm very interested to try more from the line in the future. 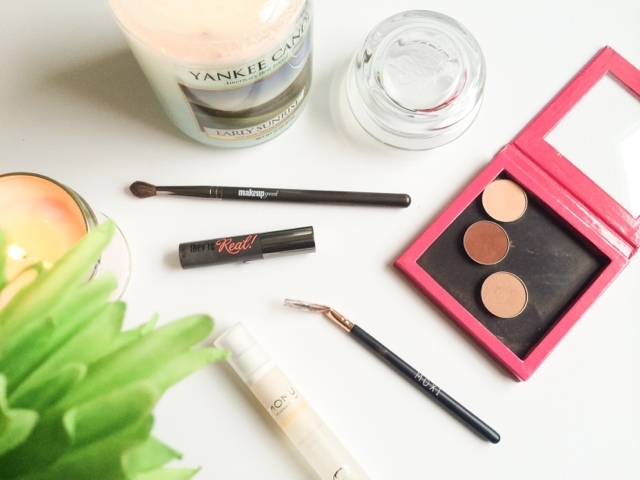 What have been your August Favourites? Love the look of the makeup geek shadows, i must get my hands on a few!